Wonder no longer, Simon and I were going to be village people in a gassho style house. Kyoko, the host of the gassho hostel, was an energetic and spirited woman whose mannerisms were as animated as an animae character. After laying down the ground rules of the house (open the door like a geisha, walk lightly like a ninja), we were shown our room – which was just a shared spot on the floor under the steep thatched roof. Not bad, especially when we found out there was wifi, a 24 hour hot shower, and a heated toilet seat complete with bidet. It wasn’t exactly the authentic village experience we were hoping for, but who were we to complain? 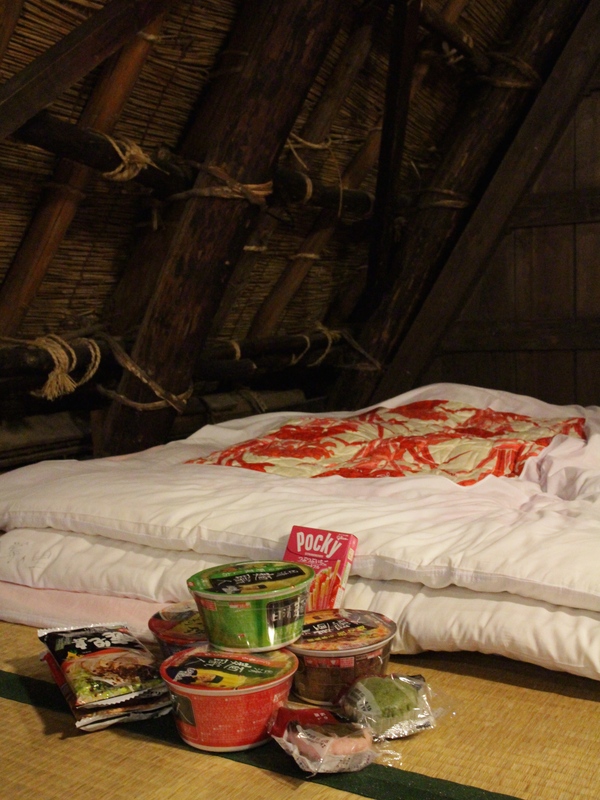 The two story house had bare wooden walls and floors, with the sleeping quarters and living areas lined with tatami mats. There was no insulation. As soon as night fell, we could feel the coldness seep in through the cracks and crevices of the house, a frigid chill that percolated into our bones with a deathlike grip. The center of the house was the common space, and it was the only room with a gas heater as well as a small fire pit. Needless to say, Simon and I found ourselves spending most our time in this cozy room to avoid the frosty conditions. We were armed with instant noodles because weren’t expecting food, so we were more than pleasantly surprised when Kyoko hosted what she called a miso party. 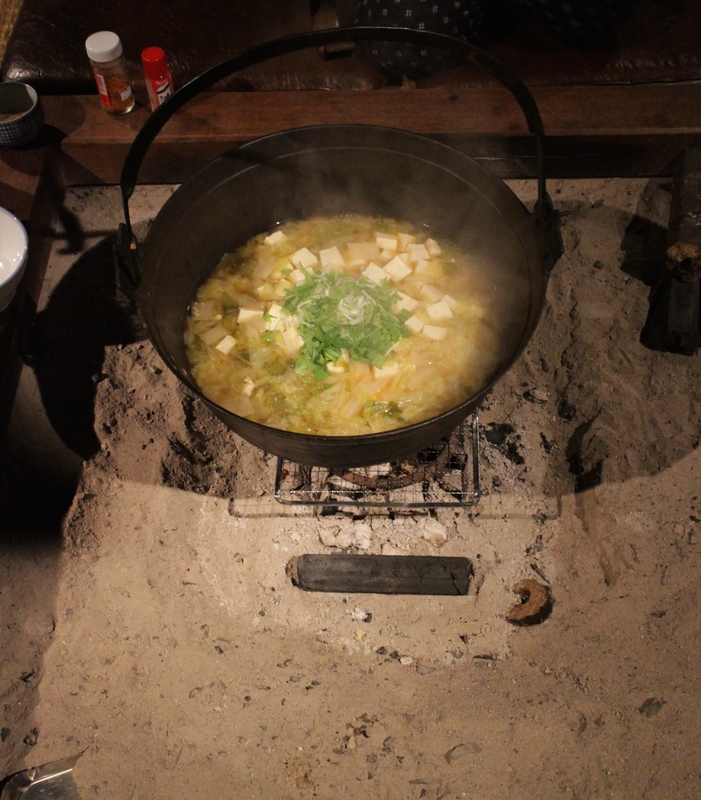 At 7pm, guests gathered around a cauldron that hung over the fire pit, and enjoyed heaping bowls of hot miso soup that warmed the even the coldest of fingertips and toes. Simon and I savored the miso soup to the very last drop, and unashamedly helped ourselves to seconds and thirds. Maybe it was the bitter cold, the soup’s home cooked factor, or perhaps it was the company we were with, but it was one of the best miso soups I have ever had in my life. 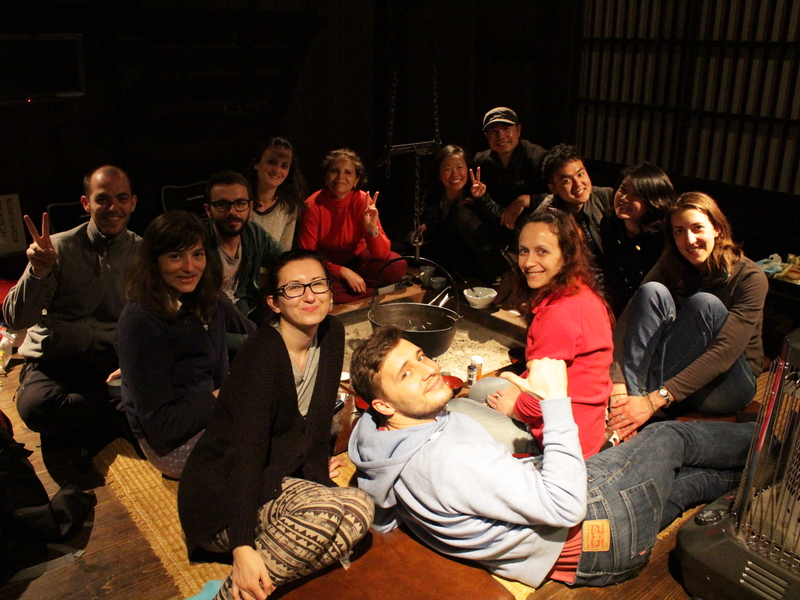 There were travelers from all walks of life that gathered under the shelter of the gassho house during our stay. We met a monk who was surprisingly well connected to technology, a young man from Spain who relished his solo travels, a Malaysian family with an exceptionally gregarious father, and a lively group of Romanians. And then there was me and Simon, the Americans. We all branched off in separate conversations yet at the same time came together and chatted heartily as a collective group. 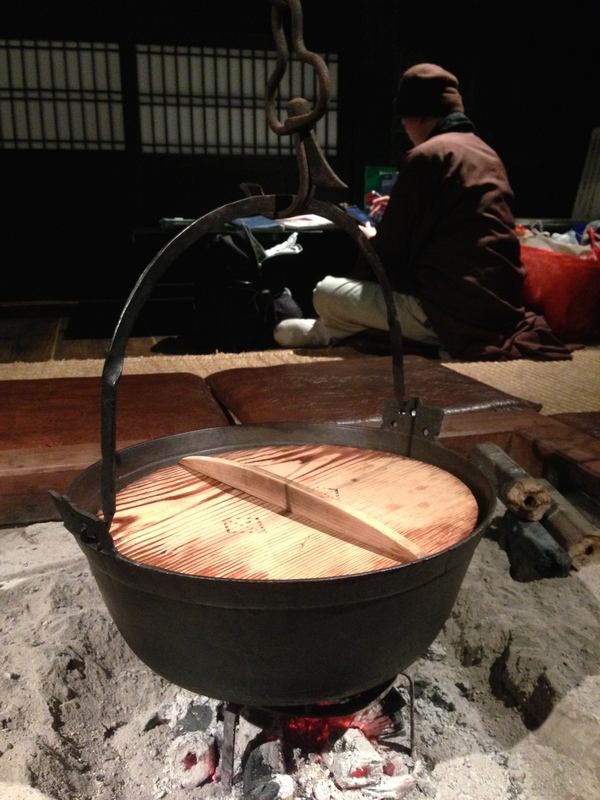 We discussed how we liked Japan so far, where we had been, and where we planned to go after our stay at the gassho. I enjoyed learning about what motivated everyone to come visit the village, as well as where they were from. The group of Romanians spoke so passionately about their country that Simon and I are convinced that we need add Romania onto the list of destinations for our round the world trip. When the last of the miso soup was ladled, and the fire began die down, I knew the evening was drawing to a close. Although it was still early, the gassho house had a lights off rule at 10:30pm. Simon and I said good night to the group and exited the room – leaving the comfort and warmth emanating not just from the heater, but also radiating from the wonderful people we were so fortunate to meet under one thatched roof. As Simon and I sandwiched ourselves between the futon and the pile of heavy blankets, we talked about how much we had enjoyed the evening. Indeed, this was the kind of experience we had both hoped for, and having met such great people along the way had only exceeded our expectations. At some point my eyelids grew heavy with the weight of drowsiness, and despite the cold, I drifted off into unconsciousness, with the memory of the miso party still warm in my heart.